Even though we catalog and promote fictional work, we include graphic novels due to their creative, imaginative, and artistic approach. Thanks to Evan Fraser for permissions to repost this graphic novel’s book cover and descriptions. 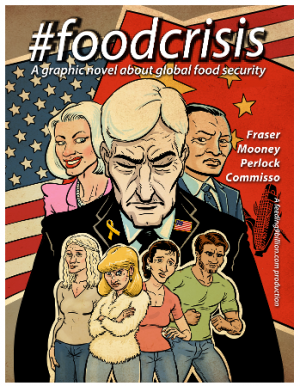 #foodcrisis is a graphic novel, with a publication date of December 1, 2014; the book has a Kickstarter campaign geared toward covering the costs of printing and shipping approximately 150 copies of #foodcrisis to educators. The more money that is raised, the wider this tool can be distributed. Follow this link to contribute! For anyone not familiar, please read on. Some people even describe this as a “perfect storm” of problems and predict that worse poverty, riots and war are almost inevitable unless the farmers of the world produce 70% more food. Others point out that we have enough food, only it’s not adequately distributed. Still others think that modern agriculture is hopelessly broken and to survive the 21st century, we need to embrace small, local farming systems. But advocates for one or other of these positions often hold extremely strident views. For instance, advocates of better food distribution often argue that the only way to fix our broken food system is for everyone to adopt a vegetarian diet, which they claim will help because meat takes a lot more resources to produce than grains or vegetables. But others disagree, and think this is naïve arguing that all we need to do is give more funding to research centers so that scientists develop new types of seeds that can produce more food with less resources. But still others disagree and argue that large corporations tend to be the ones to benefit when new technologies are developed and that science rarely helps society or the environment. The purpose of this project, video and web page is to try and explore these issues to better understand them and explore how, and under what conditions, scientific advances, local food, better distribution, etc., can and should play a role in feeding the nine billion people who will soon call this planet home.